Asian Heritage Day 2018 at Kennywood! 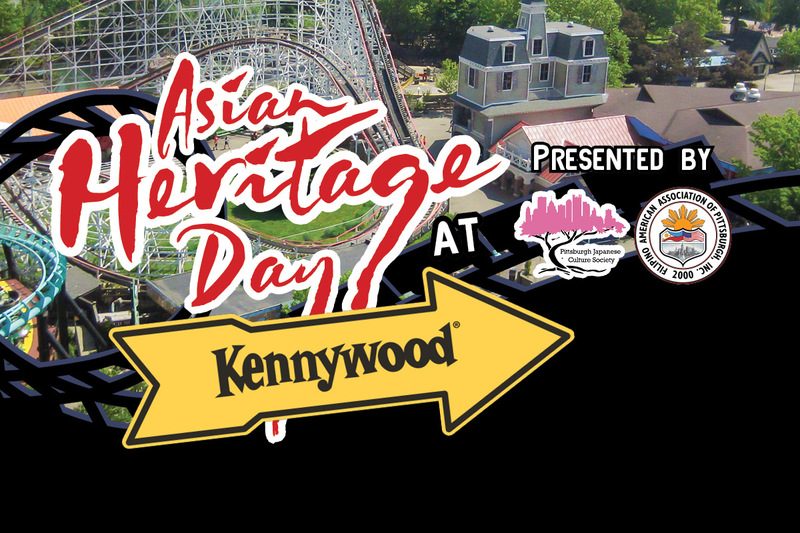 The Pittsburgh Japanese Culture Society and the Filipino American Association of Pittsburgh are proud to present Asian Heritage Day on May 19th, 2018 at Kennywood Amusement Park! Park Admission to Kennywood, for 35% off the regular Kennywood ticket price! Access to the PittJCS pavilion, where paid attendees can leave coolers and wagons while they enjoy the park! Ticket pick-up will be available from 10:30 AM to 1:30 PM at the Asian Heritage Day tent in front of the main entrance. Tickets will also be available for purchase on site. If you pre-ordered a ticket and haven't picked it up before 1:30 PM, please go to the Kennywood group sales office to pick up your ticket. Question: How do I pick up my tickets? Will they be mailed to my address? Answer: No, tickets will not be mailed. You can pick your tickets up at Kennywood. There will be a special Tekko Will Call registration area, with Tekko Staff, where you can pick your tickets up! Question: What time can we pick up our Kennywood Day tickets? Answer:Kennywood opens at 10:30, so Tekko Day attendees can pick their tickets up from 10:30 am - 4:00 pm. Question: Can I purchase Kennywood tickets from the PittJCS and use them on another day? Answer: Yes, but they need to be picked up in person on May 19th! Question: When does preregistration close? Answer: Register today because the price will go up to $29 on May 19th! Question: Do I need to preregister? Answer: No! Keep in mind that preregistering is cheaper, at the door it will cost you $29. Question: Are senior tickets available?